By Melissa Lennig on September 30, 2017 Leave a Comment. This content contains affiliate links. As an Amazon Associate I earn from qualifying purchases. These delicious homemade Halloween Mummy Cookies are sure to add plenty of spooky fun to your child’s lunchbox, school party, or after-school snack. They are soft, creamy, and guaranteed to delight children of all ages! These cookies are perfectly soft, just like frosted sugar cookies from a bakery. We recently brought them to a Halloween movie party, where our friends were showing The Nightmare Before Christmas on their outdoor movie screen. The cool autumn night, steaming hot chocolate, homemade apple pie, fresh cookies, fleece blankets, and warm fire made it a night to remember. Cream the butter, shortening, sugar, 2 tsp vanilla extract, and 2 eggs in a large bowl. Mix in the flour, baking soda, baking powder, sour cream, and salt. Shape the dough into two balls, then chill until firm. Roll the dough onto a well-floured surface, then cut into circles with a cookie cutter. Next, place the cutouts on a parchment-lined cookie sheet. Bake the cookies at 350° for 8 minutes. While the cookies are cooling, prepare the frosting by mixing 1 stick of unsalted butter with 3 cups of powdered sugar, 1 tsp of vanilla extract, and 3 tbsp of milk. Spoon the frosting into a bag fitted with a #104 tip. Gently pipe the frosting onto the cooled cookies using a zig-zag motion. Place 2 candy eyeballs onto each cookie. Aren’t they cute? My kids can’t wait for the next batch! 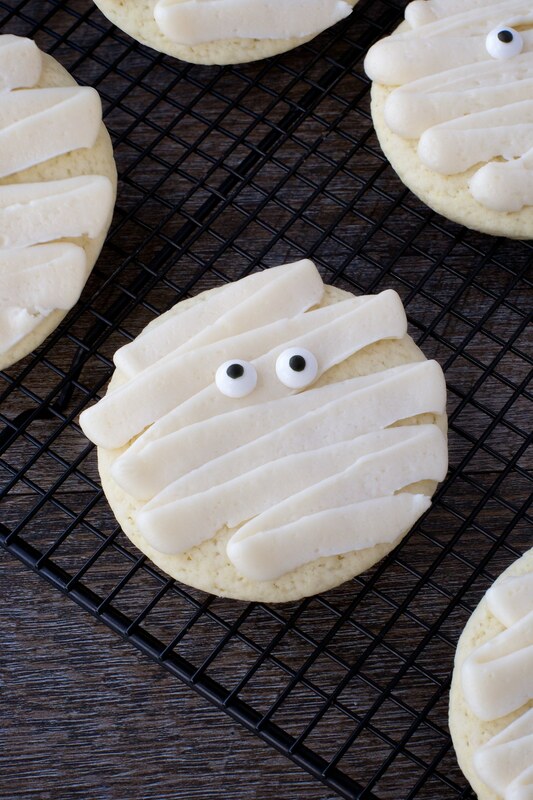 These delicious mummy cookies are sure to add plenty of spooky fun to your child's lunchbox! They are soft, creamy, and will delight children of all ages!